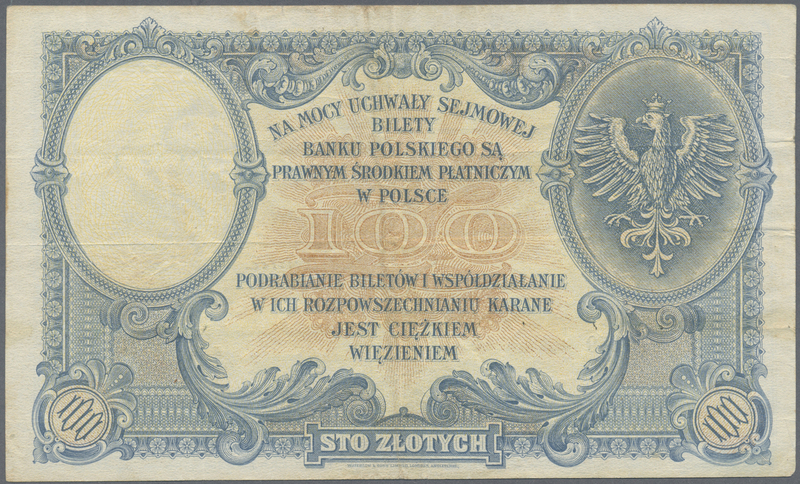 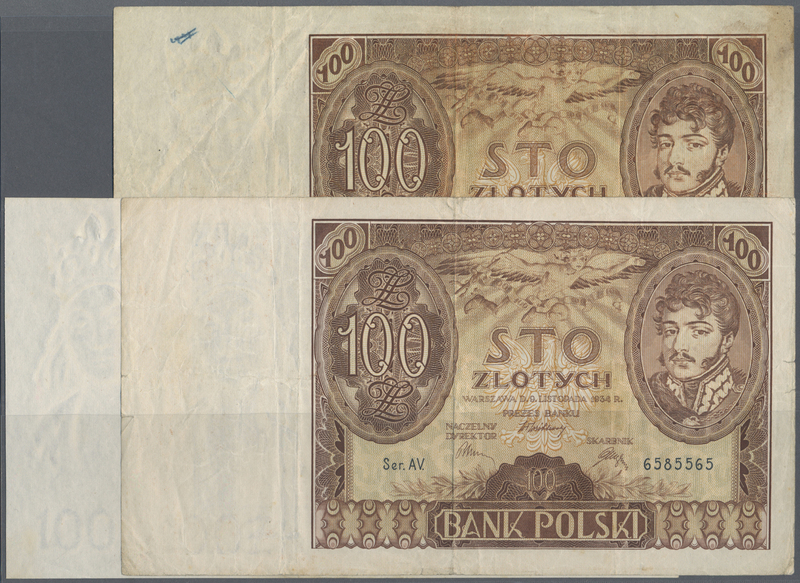 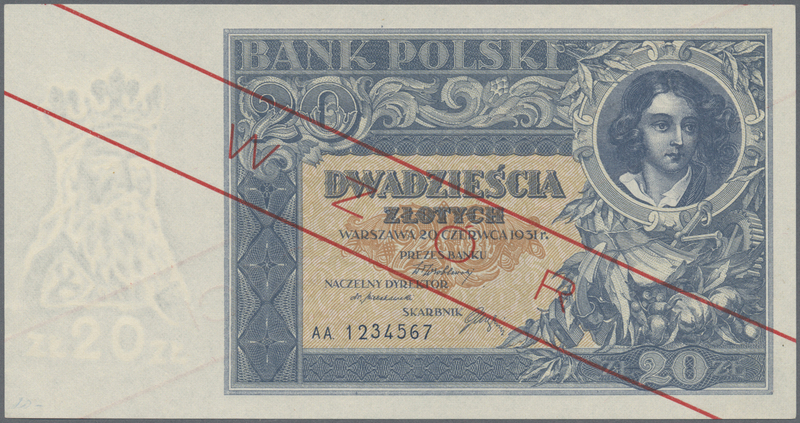 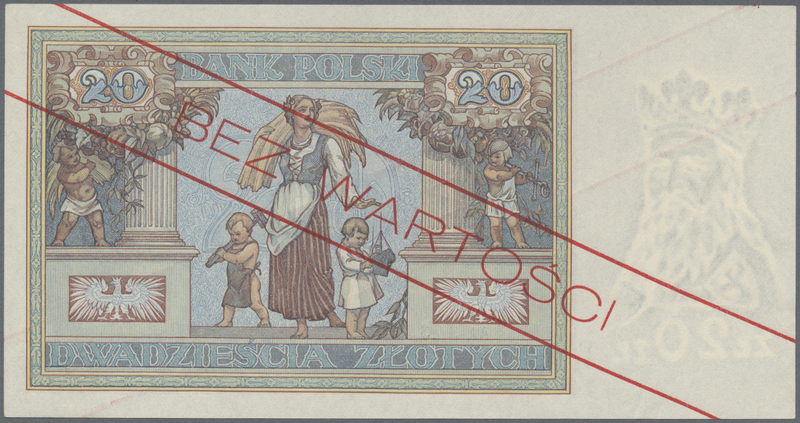 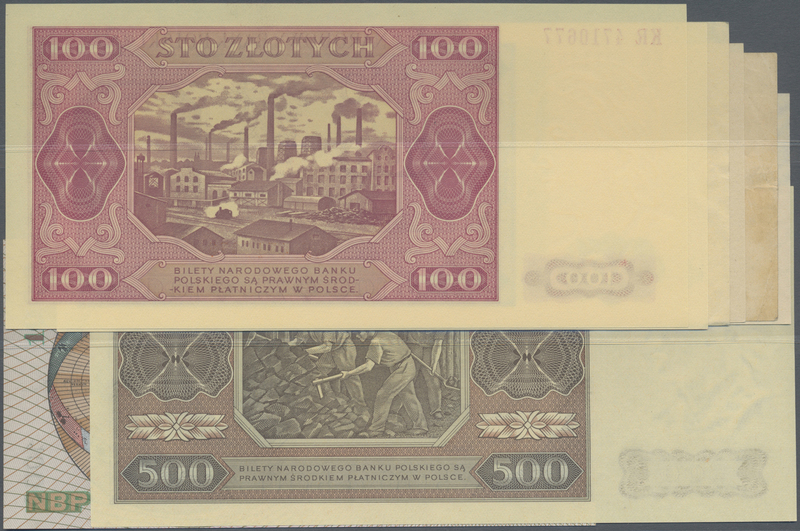 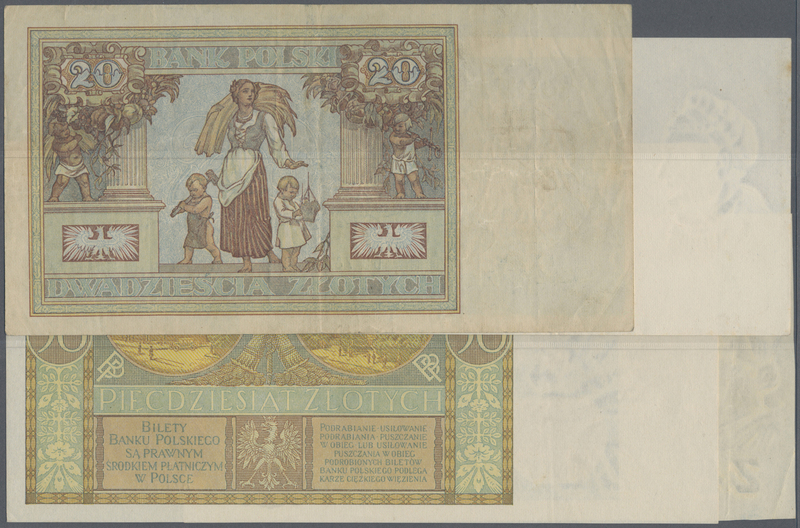 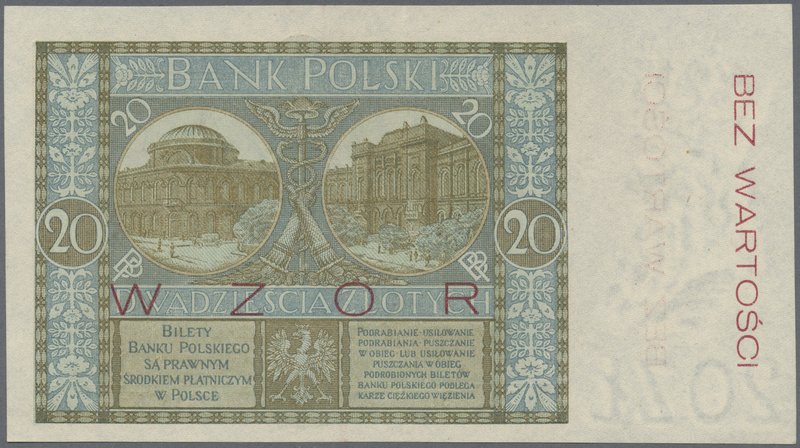 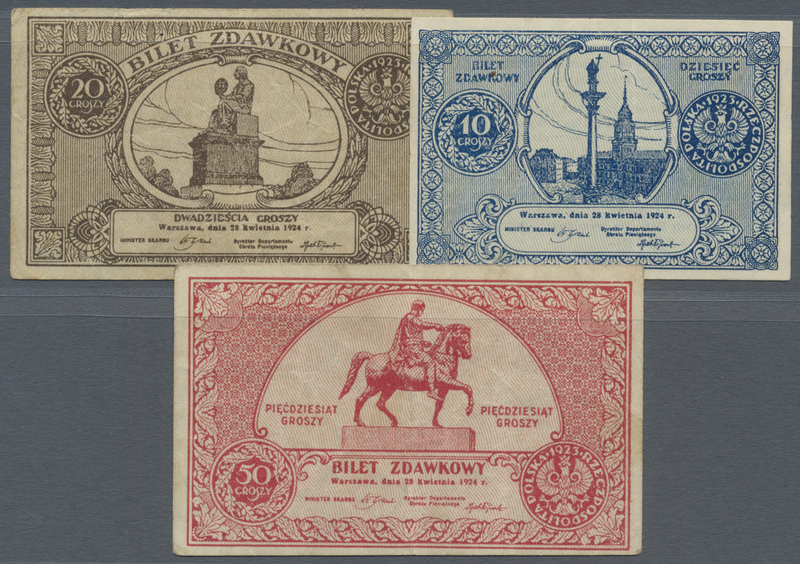 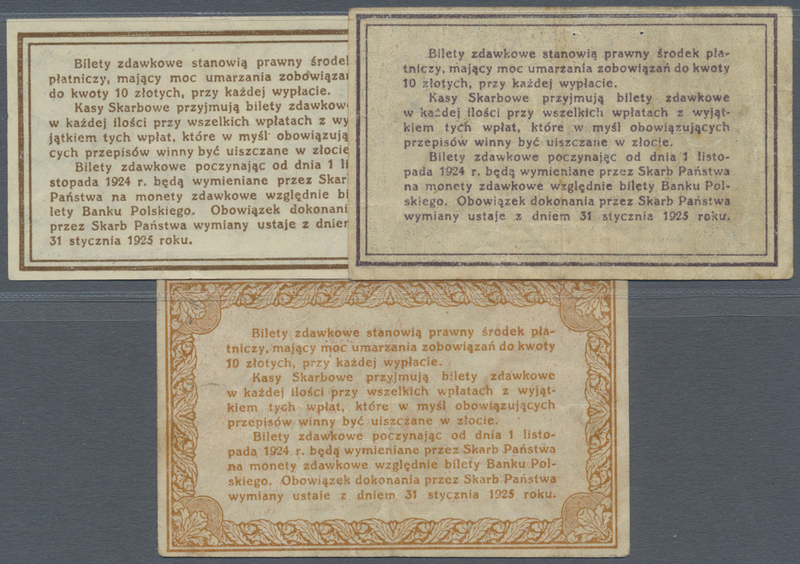 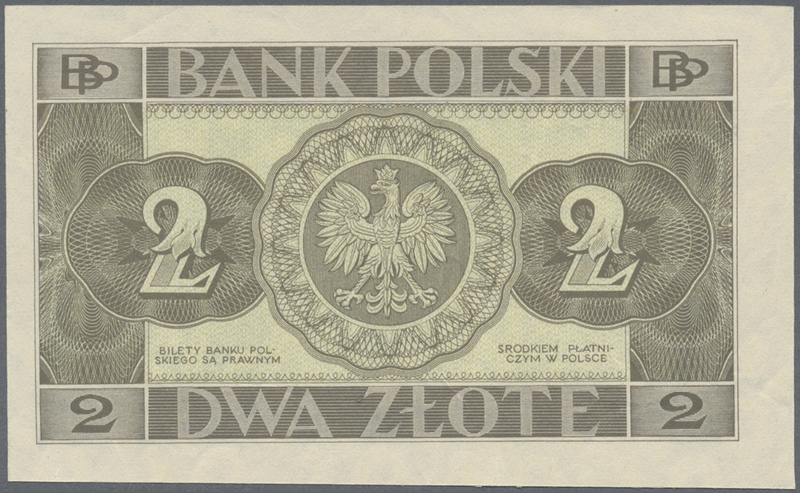 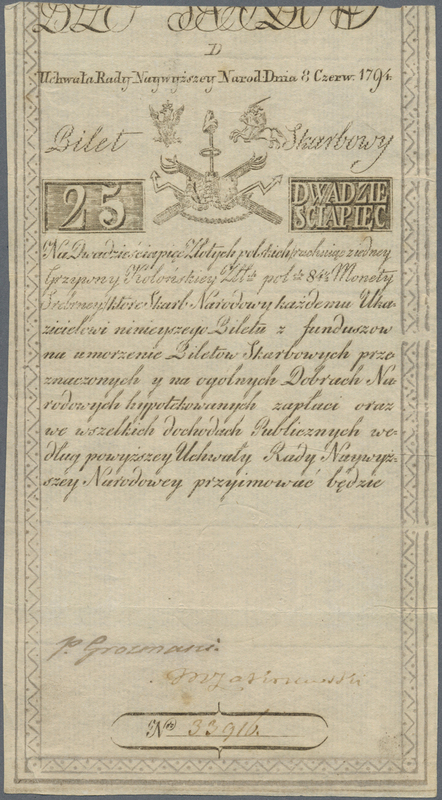 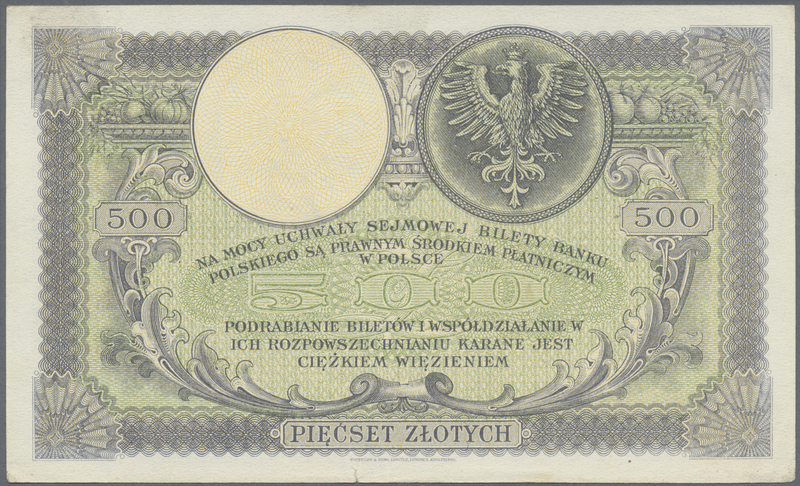 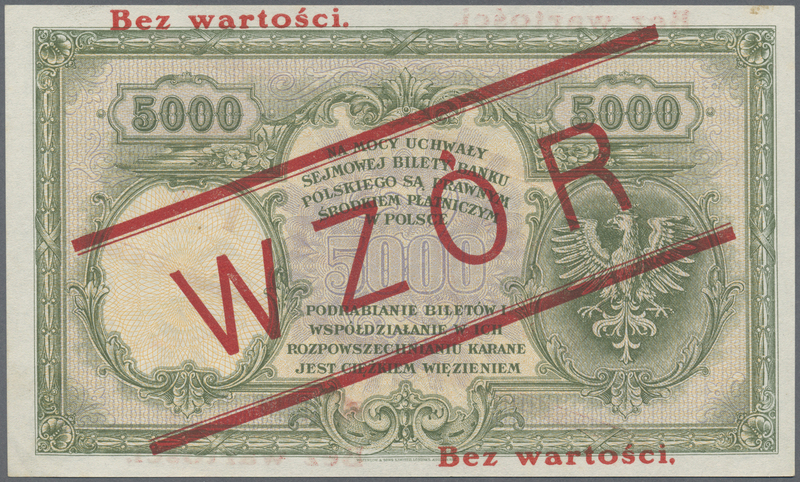 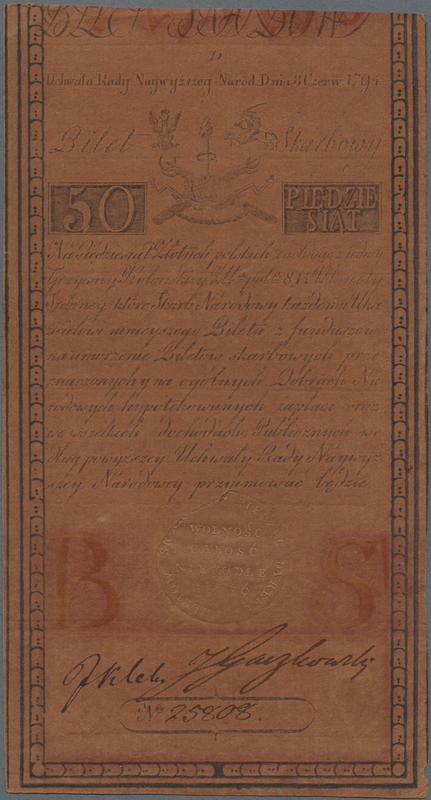 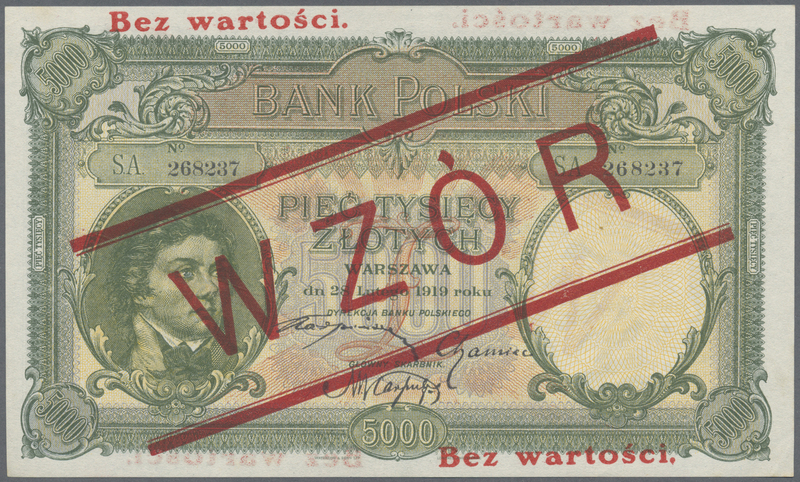 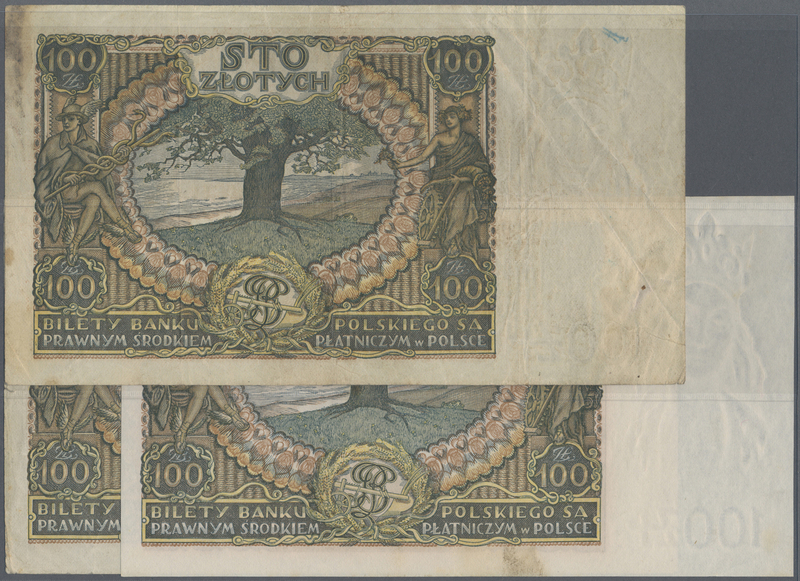 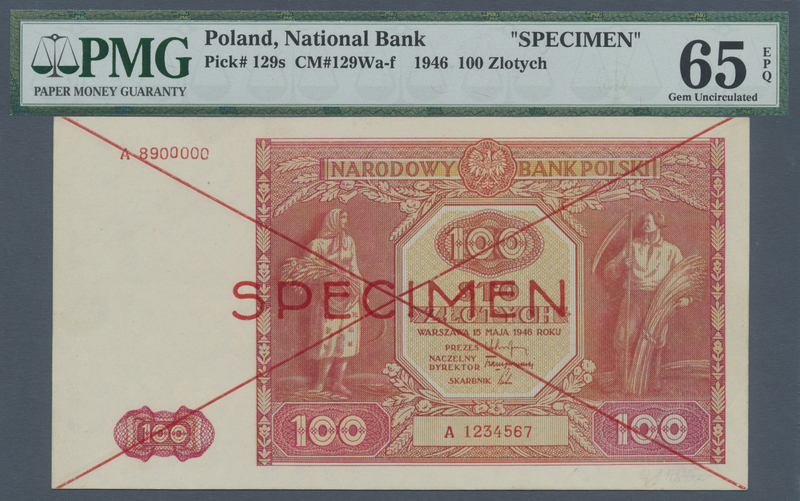 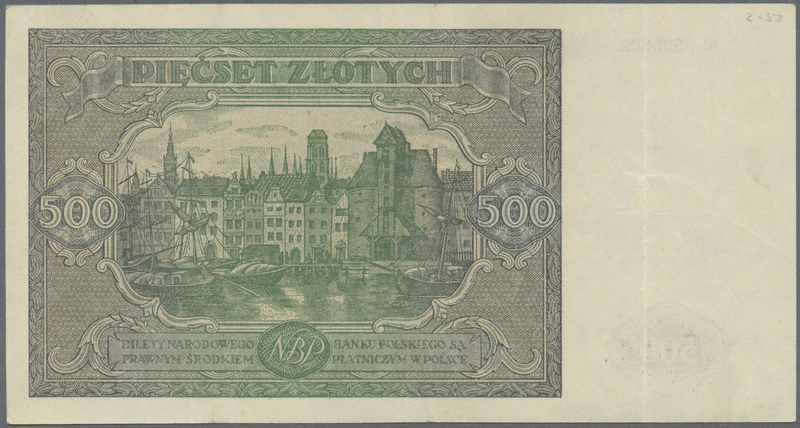 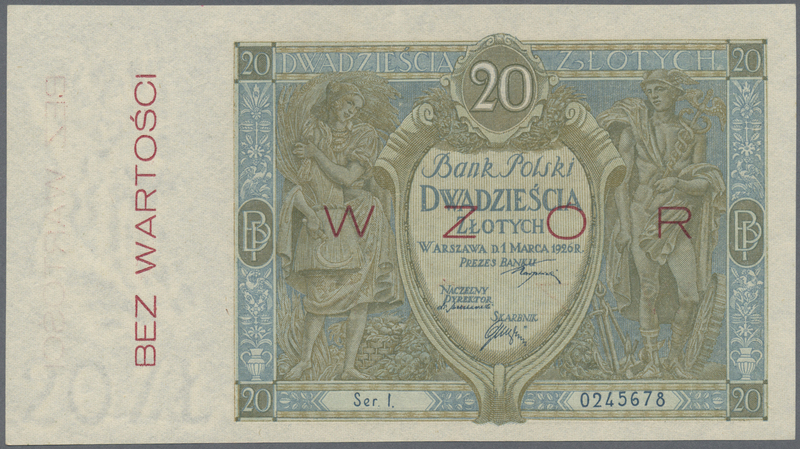 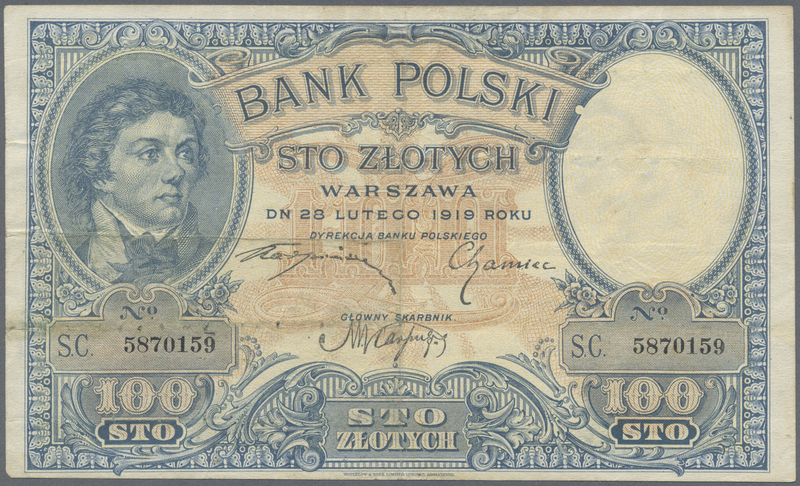 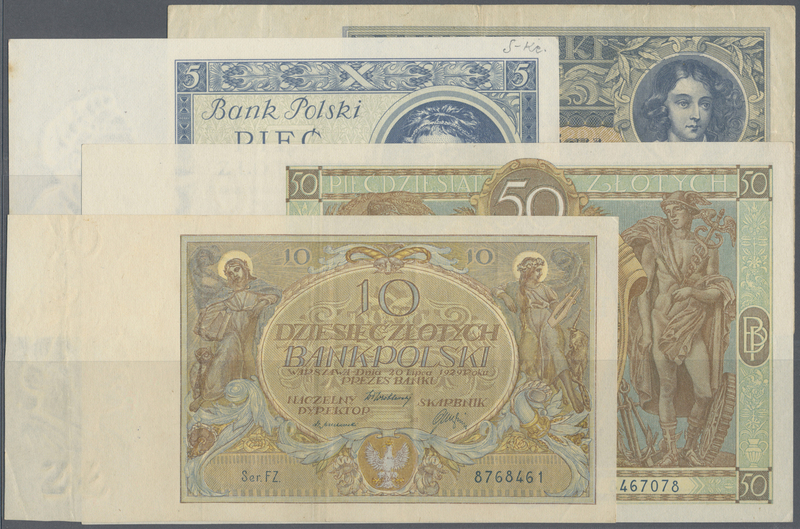 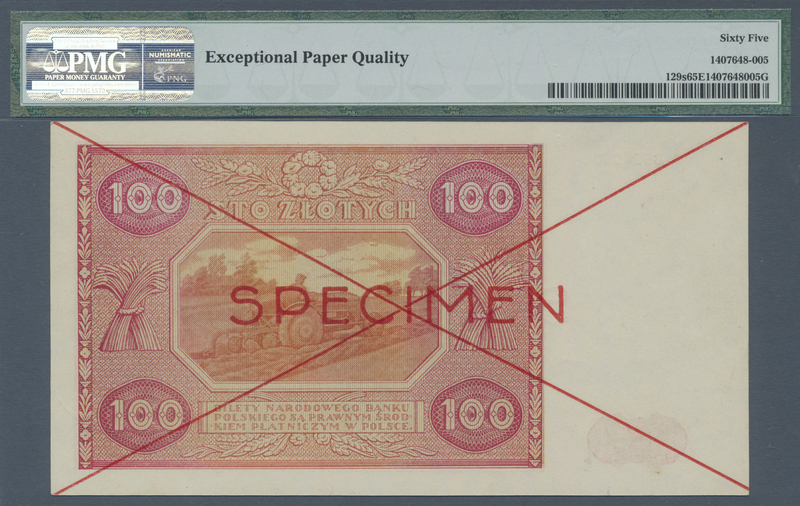 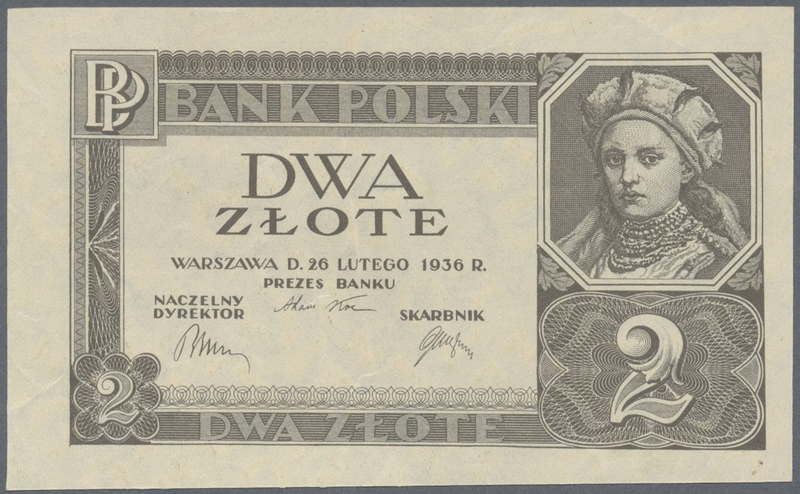 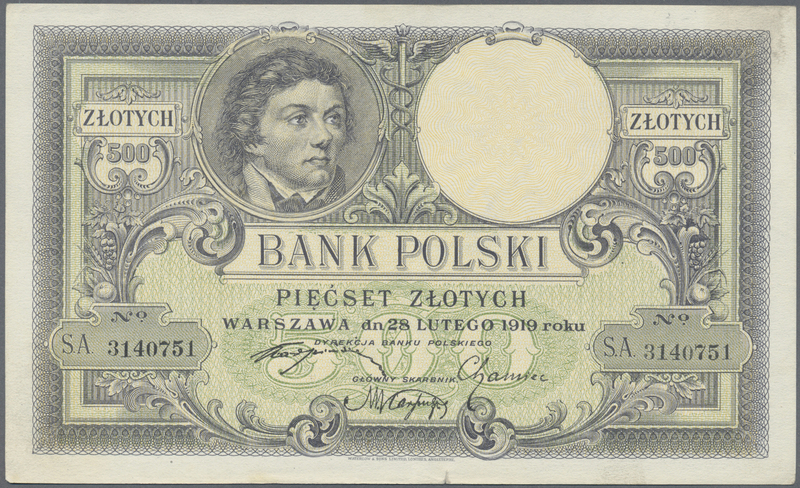 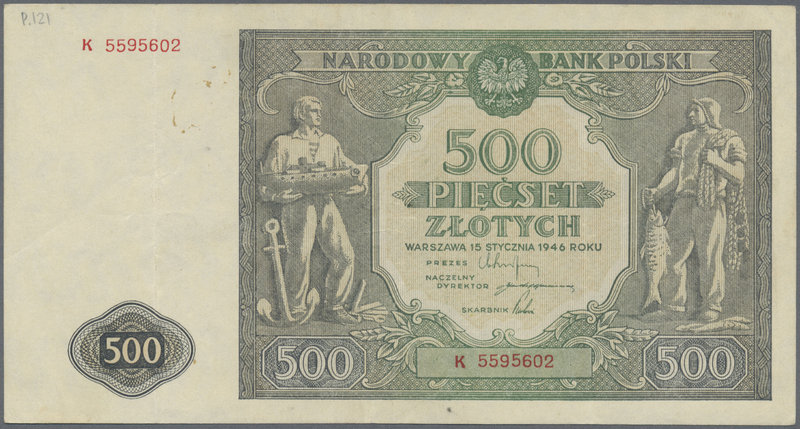 2231 Pick 129s 100 Zlotych 1946 Specimen P. 129s, in condition: PMG graded 65 GEM UNC EPQ. 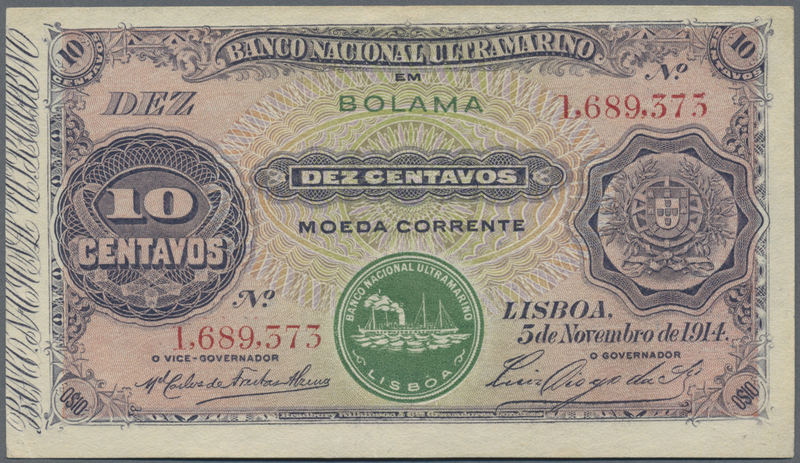 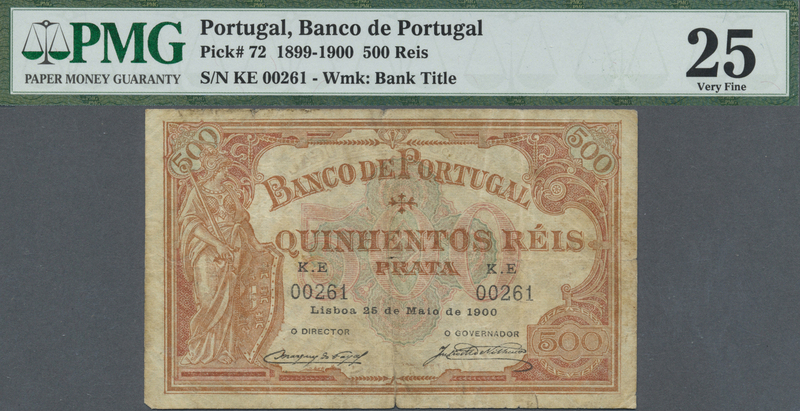 2247 Pick 28 10.000 Reis 1799 revalidation issue "Pedro IV" P. 28, stronger used with strong center fold, causing tears at borders, borders a bit used, condition: VG+ to F-. 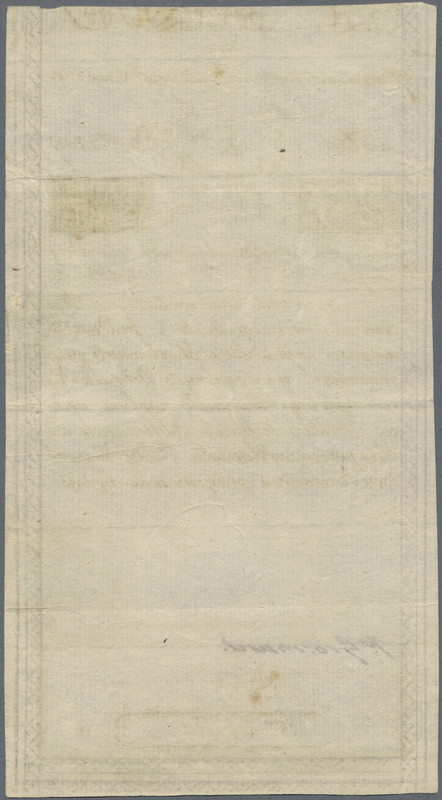 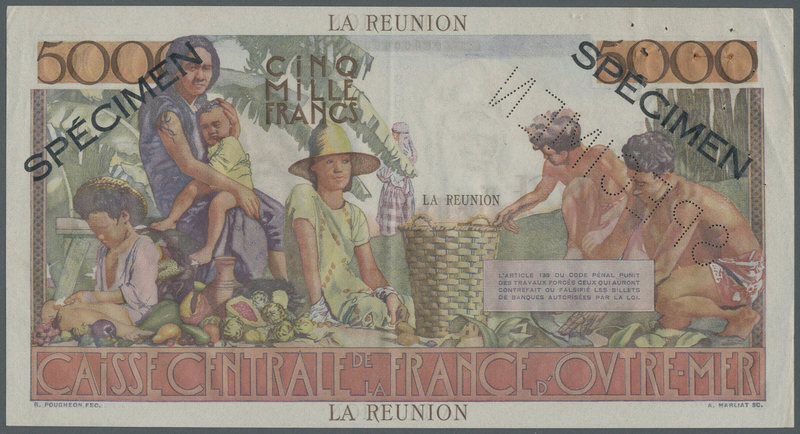 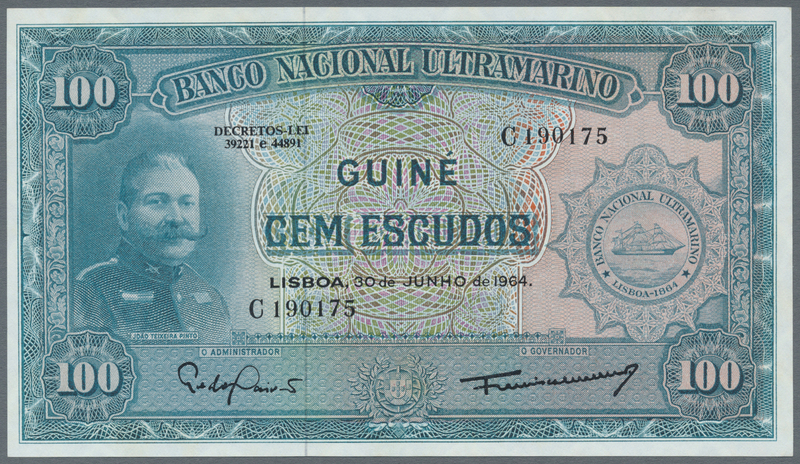 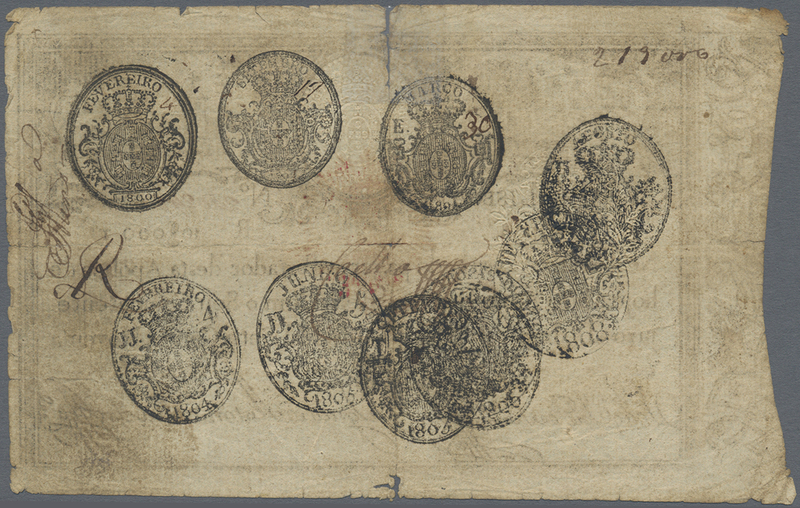 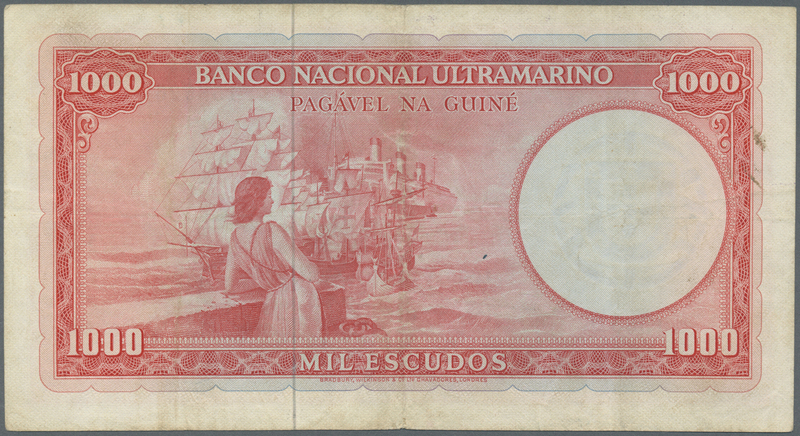 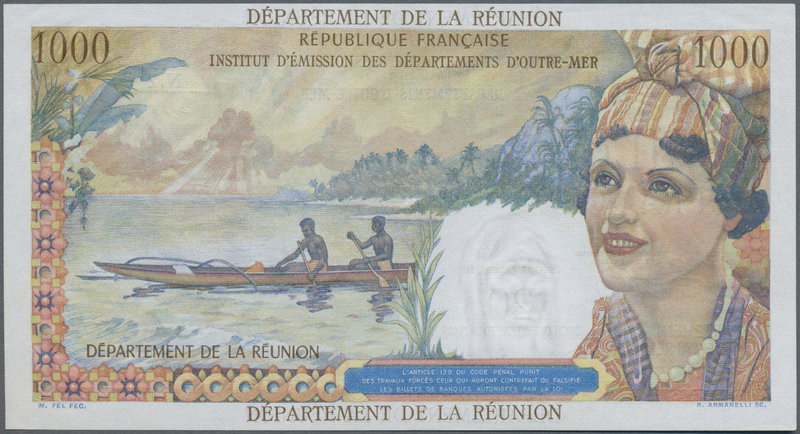 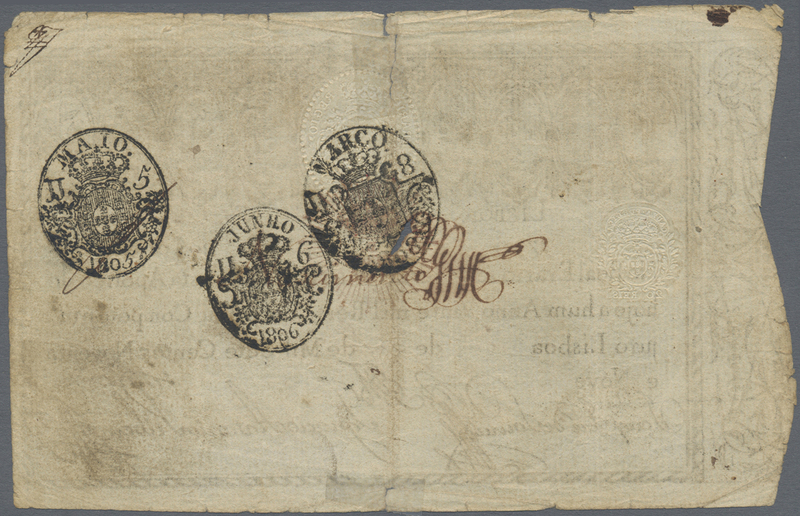 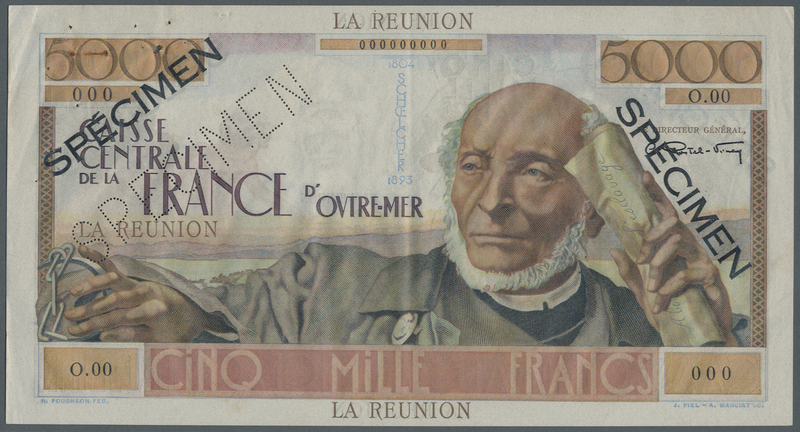 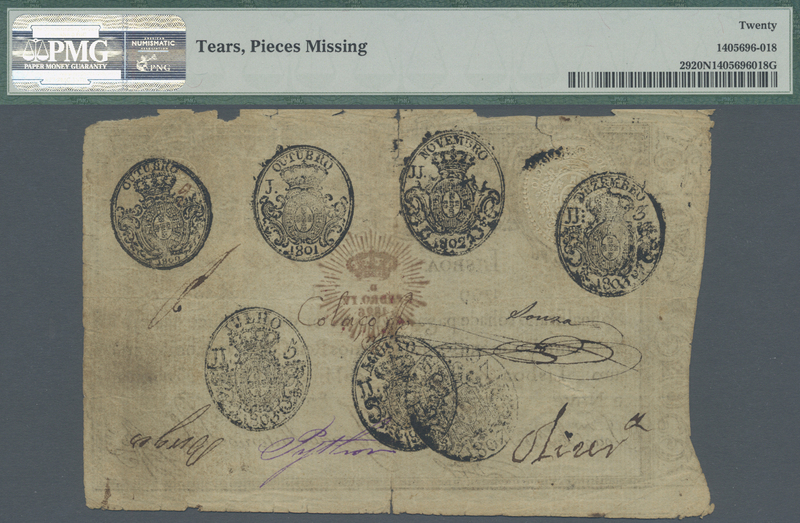 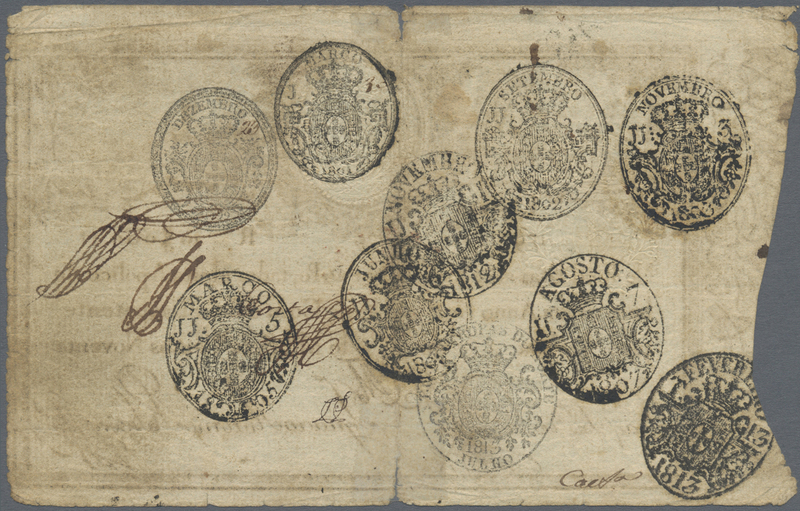 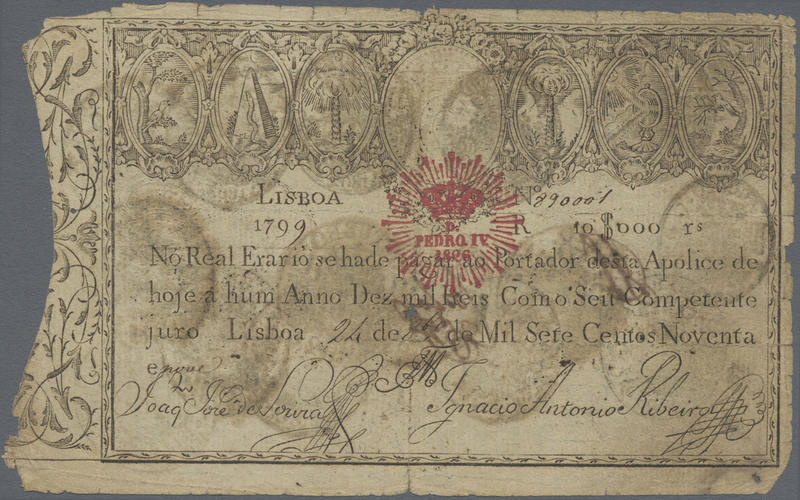 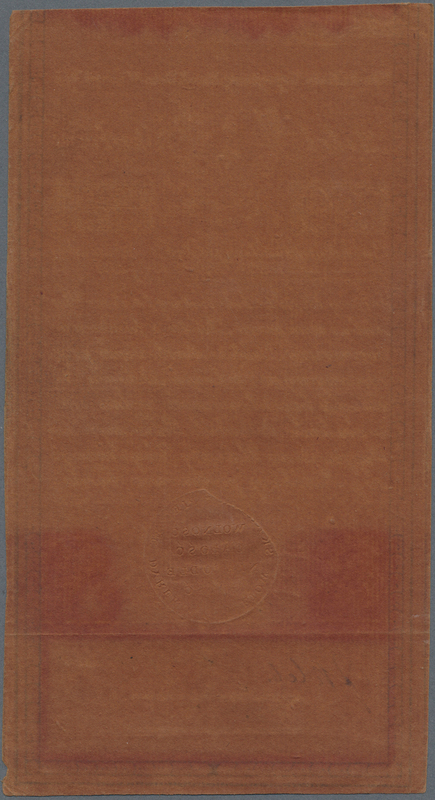 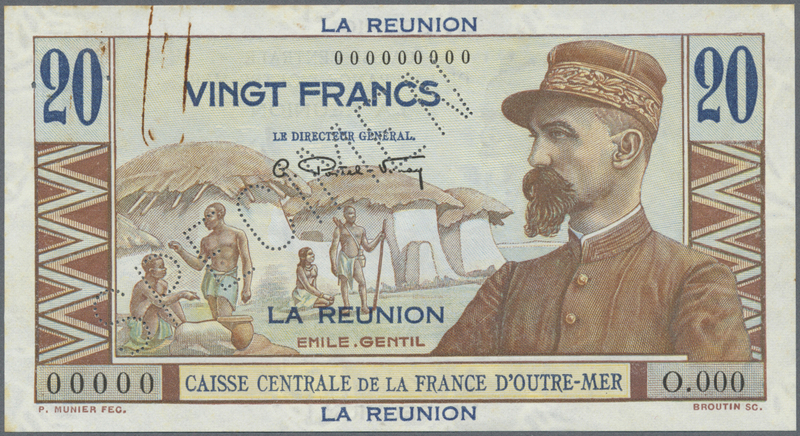 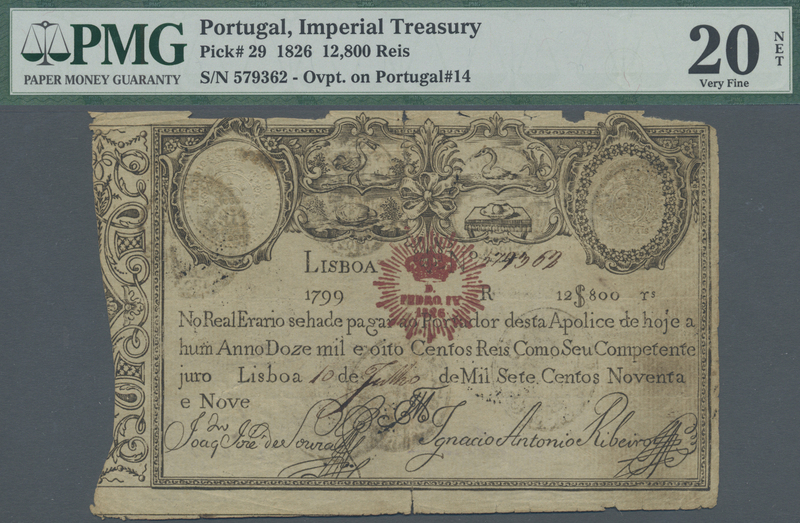 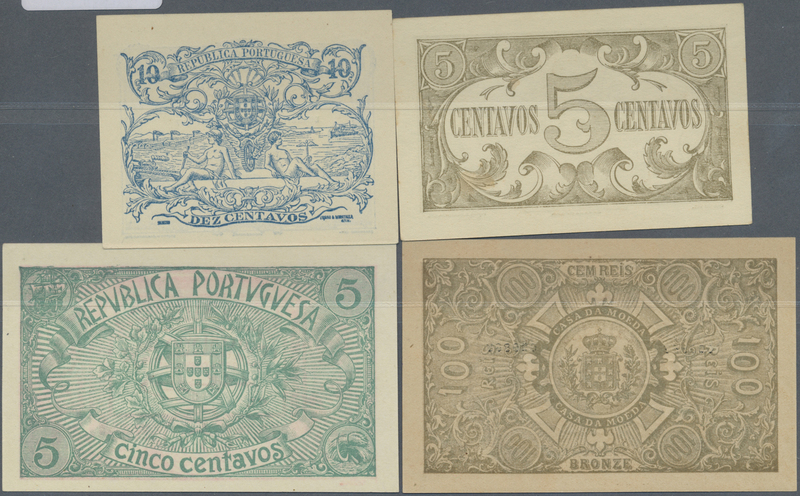 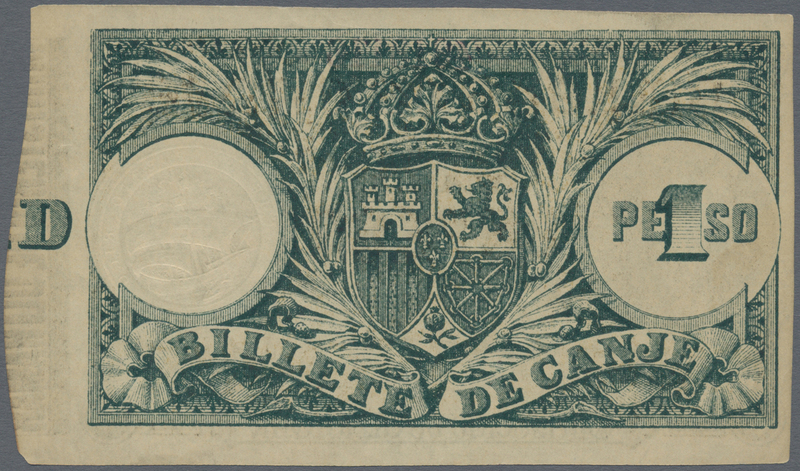 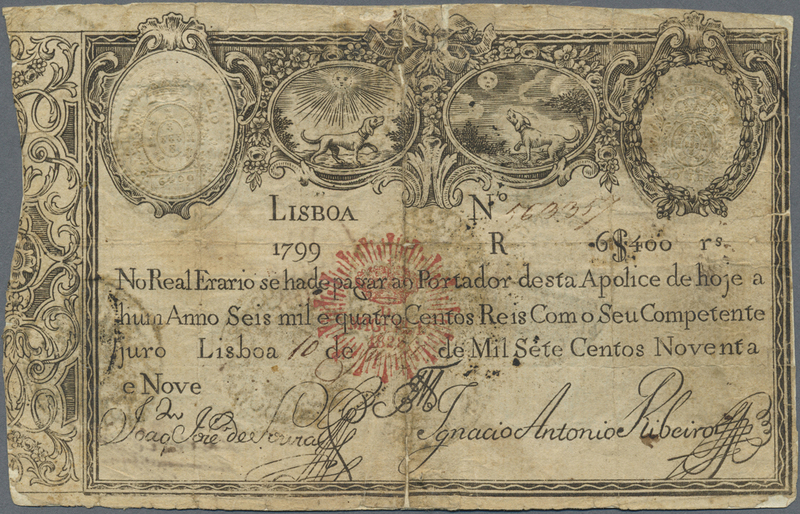 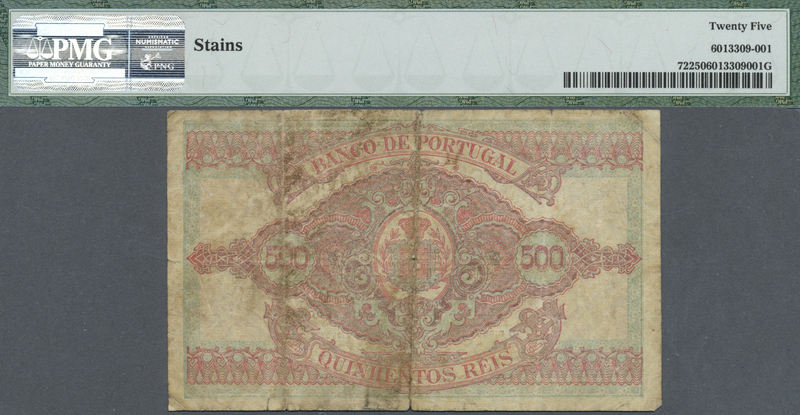 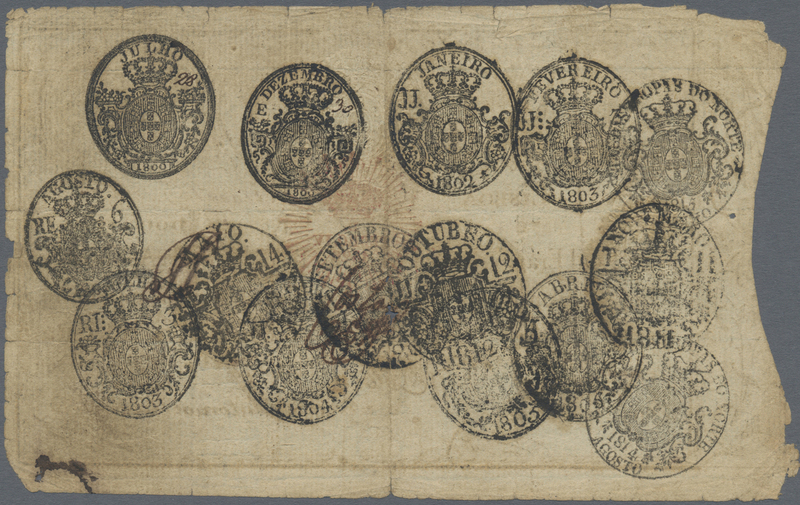 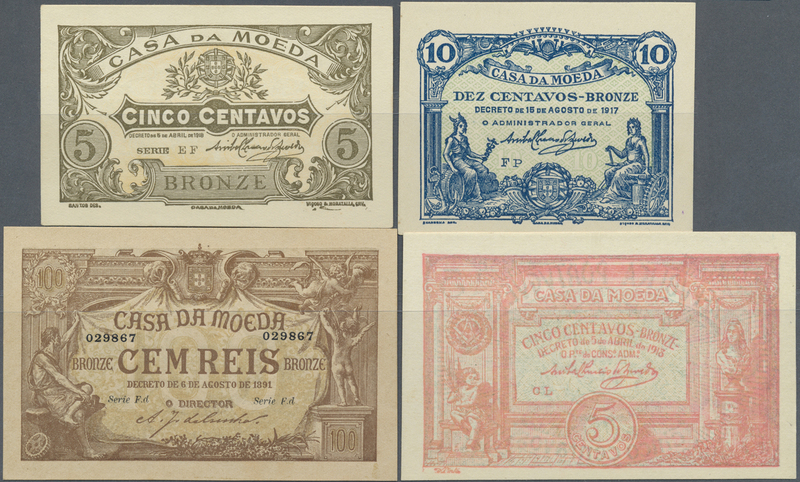 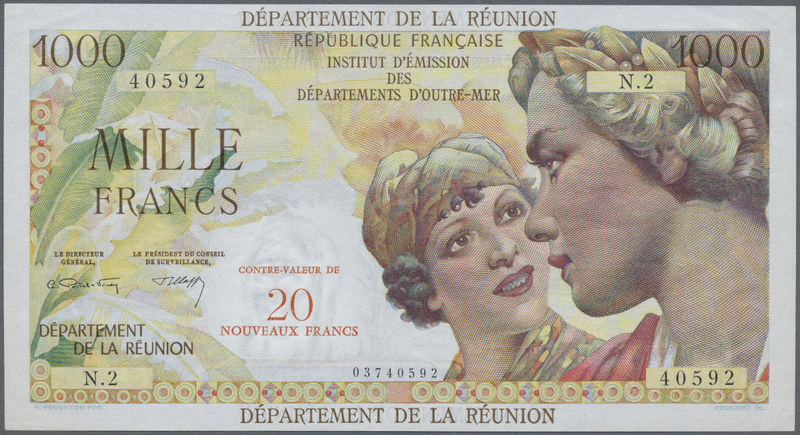 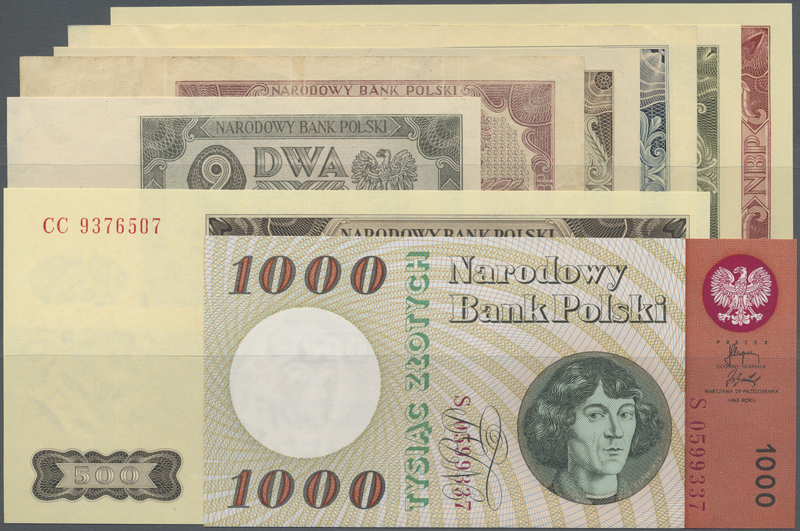 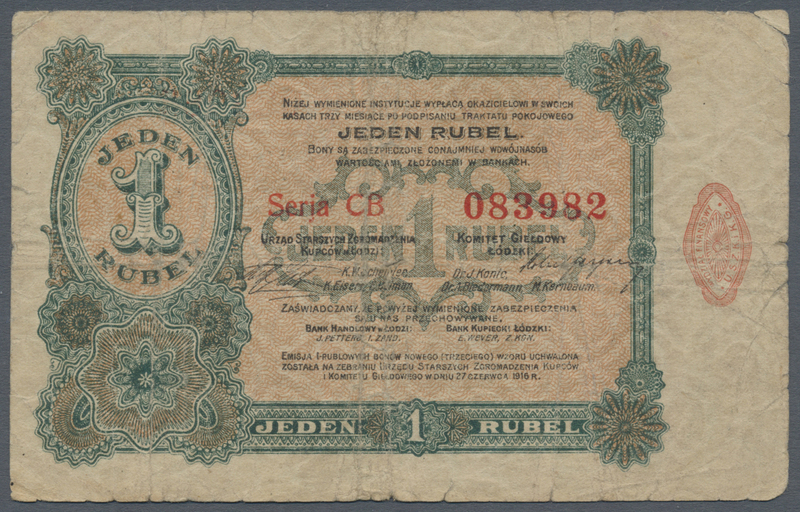 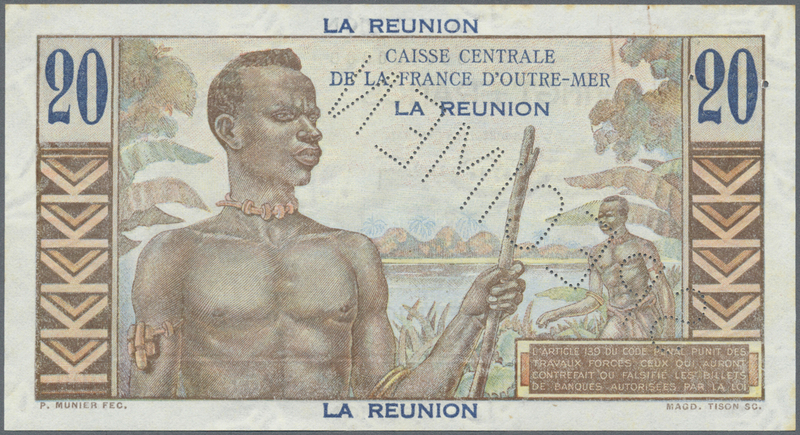 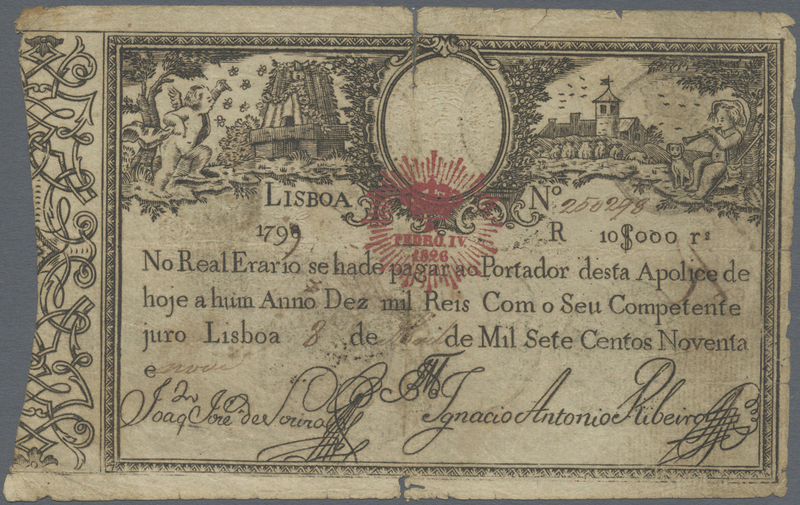 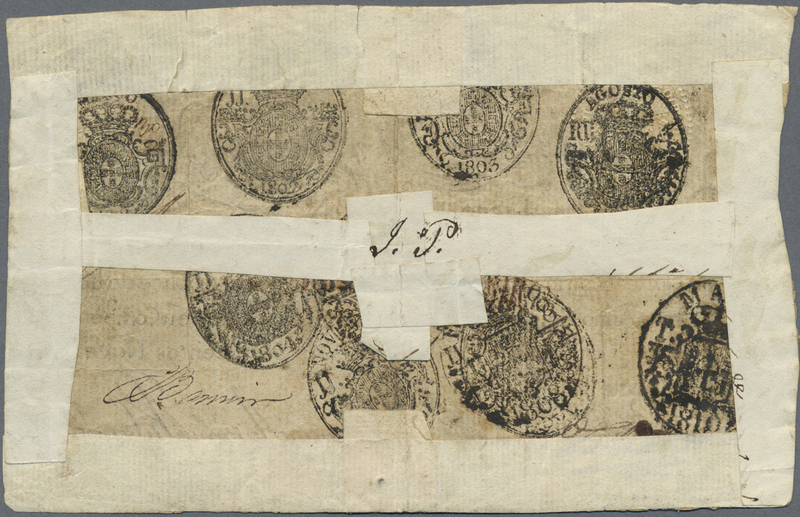 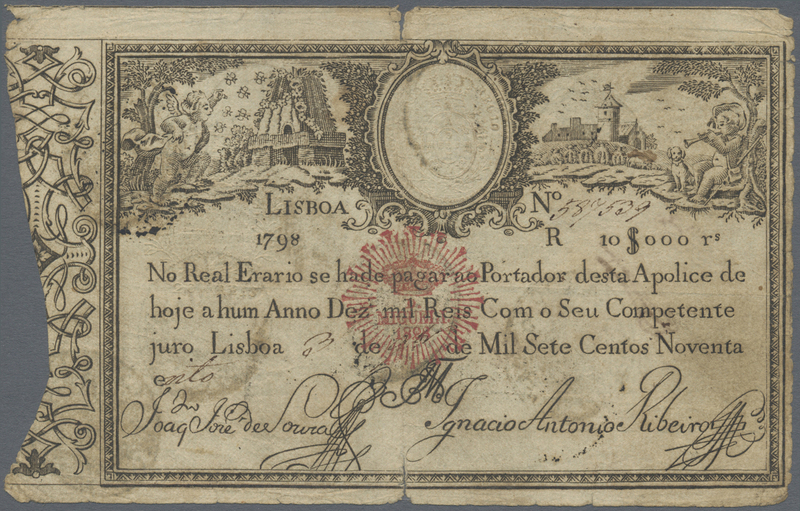 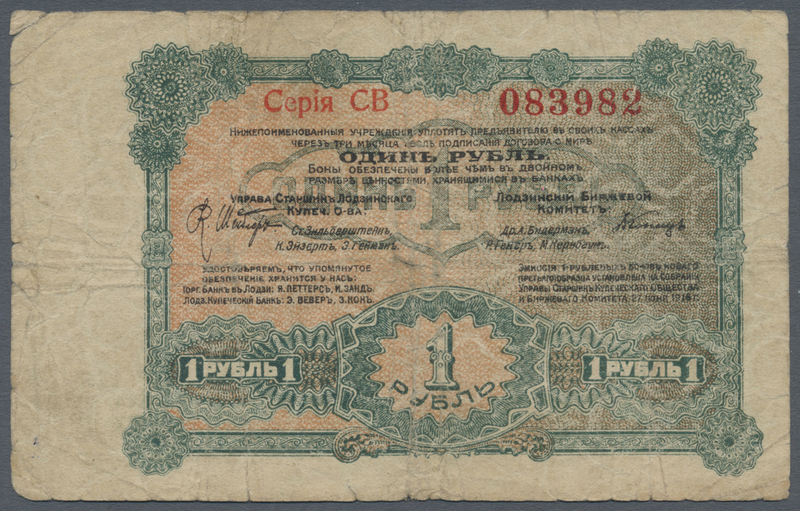 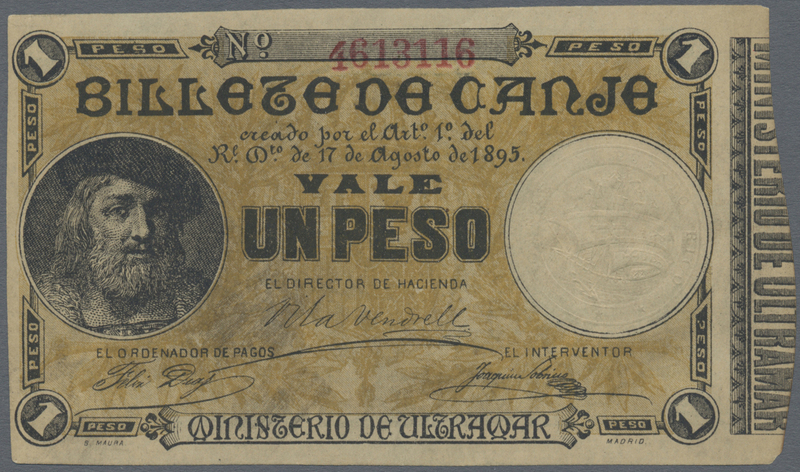 2249 Pick 31 20.000 Reis 1799 revalidation issue "Pedro IV" P. 31, stronger center fold with small pieces of tape on back for fixing minor border tears, paper still relatively clean for this type of note, condition: F.
2250 Pick 39 6400 Reis 1799 revalidation issue "Miguel" P. 39, stronger used, folds and stain in paper, many pieces of tape on back, still complete collectible, condition: G.
2251 Pick 40 10.000 Reis 1798 red stamp "Miguel" revalidation P. 40, as usual stronger used with strong center fold and tape for tear fixing at upper and lower border of center fold, condition: F-. 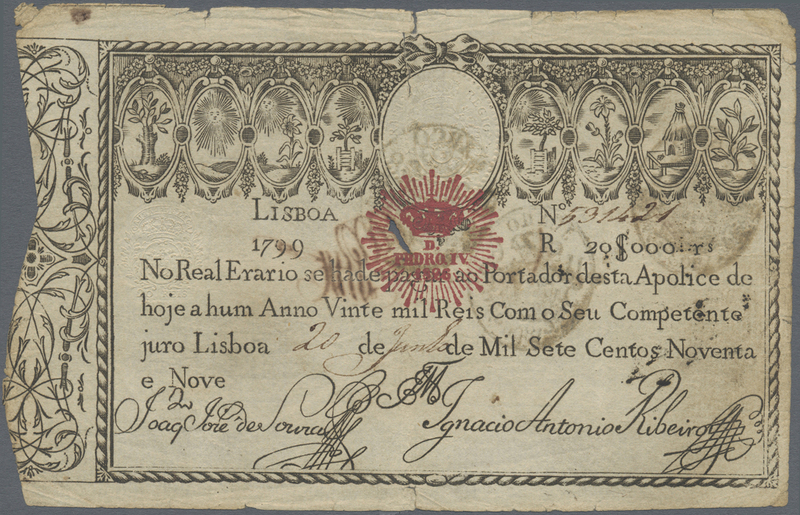 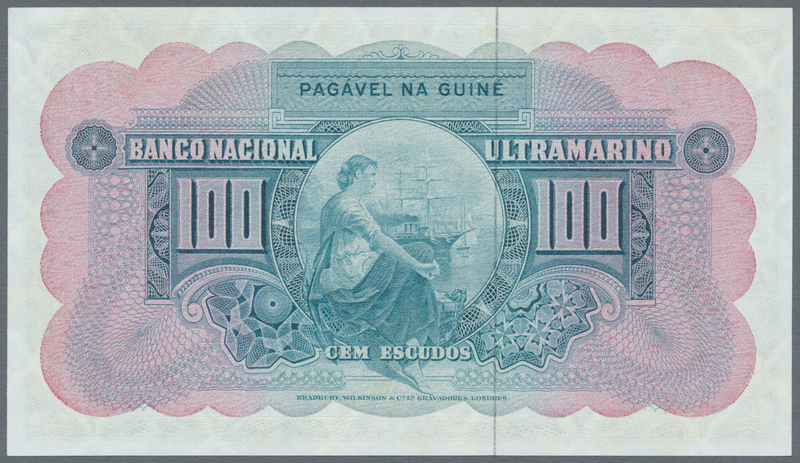 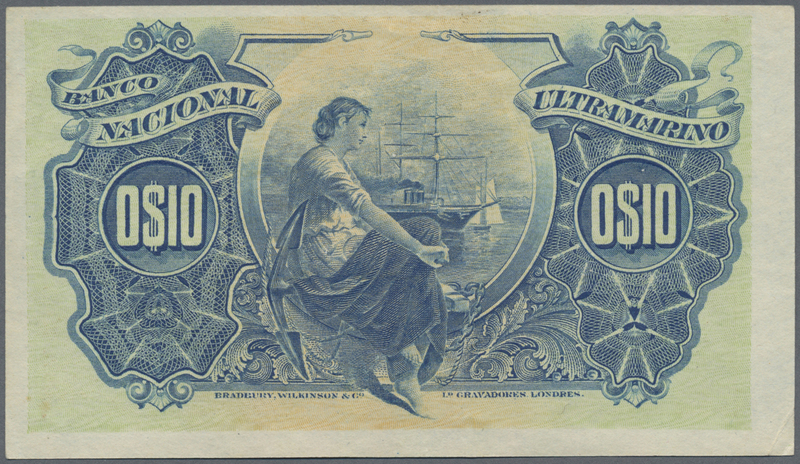 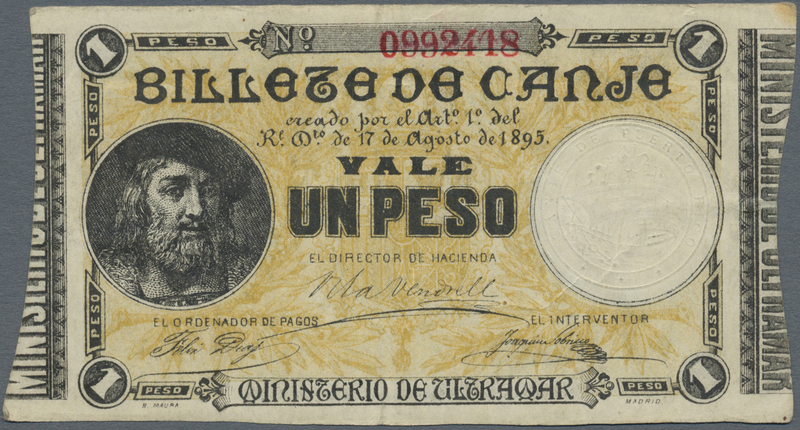 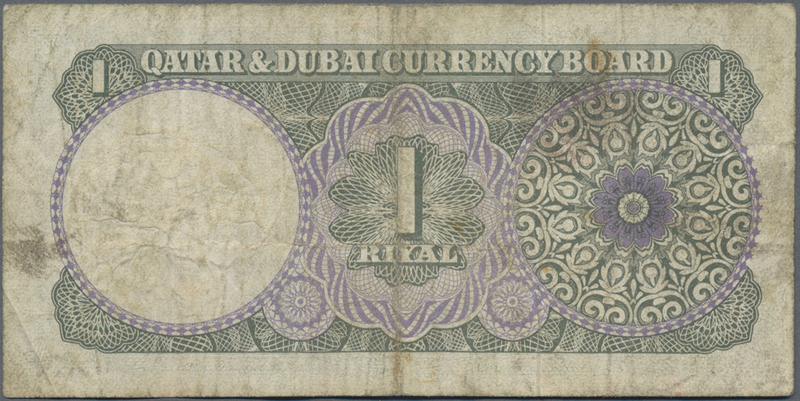 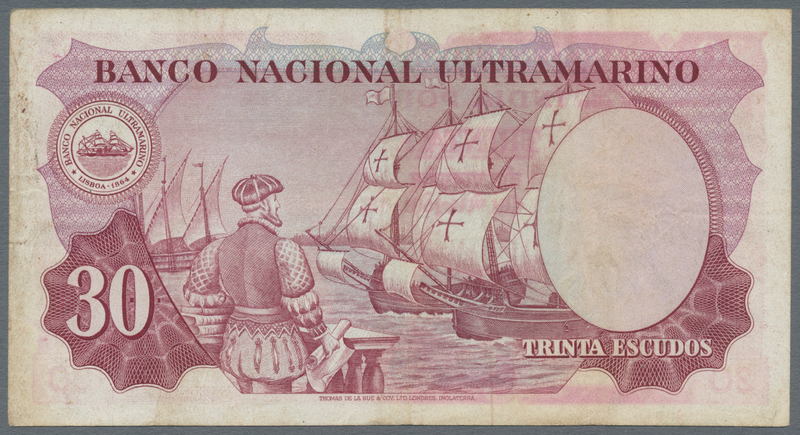 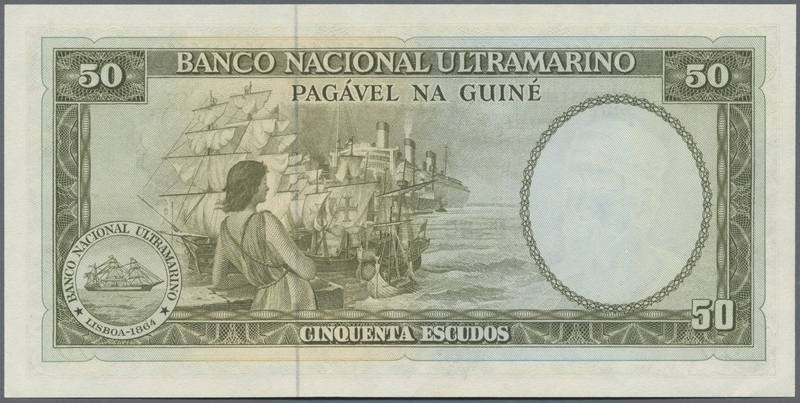 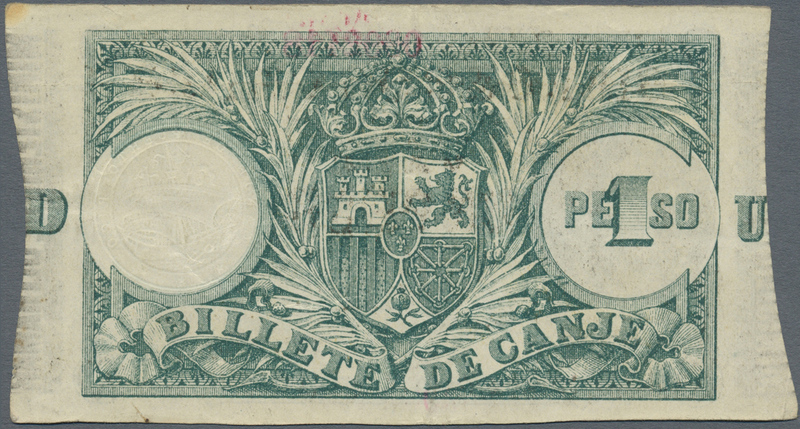 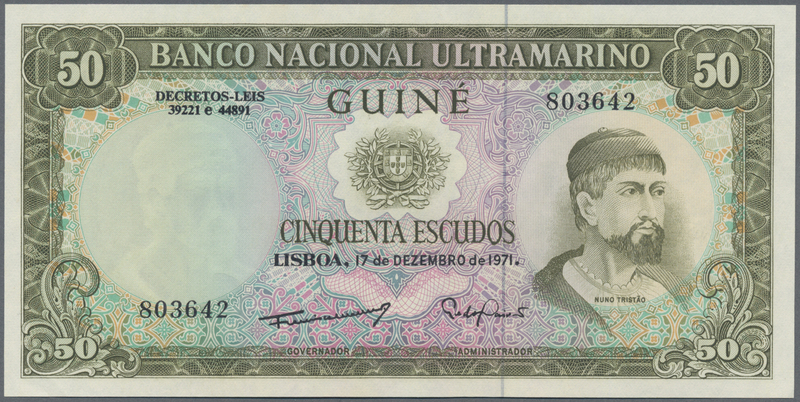 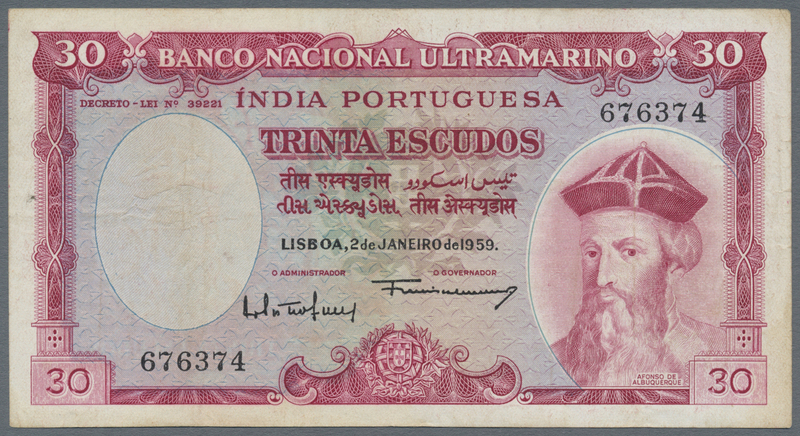 2257 Pick NL 10.000 Reis 1799 P. NL, revalidation issue "Pedro IV", stronger used with strong center fold, border use, stained paper, no repairs, no tape on paper, condition: F-. 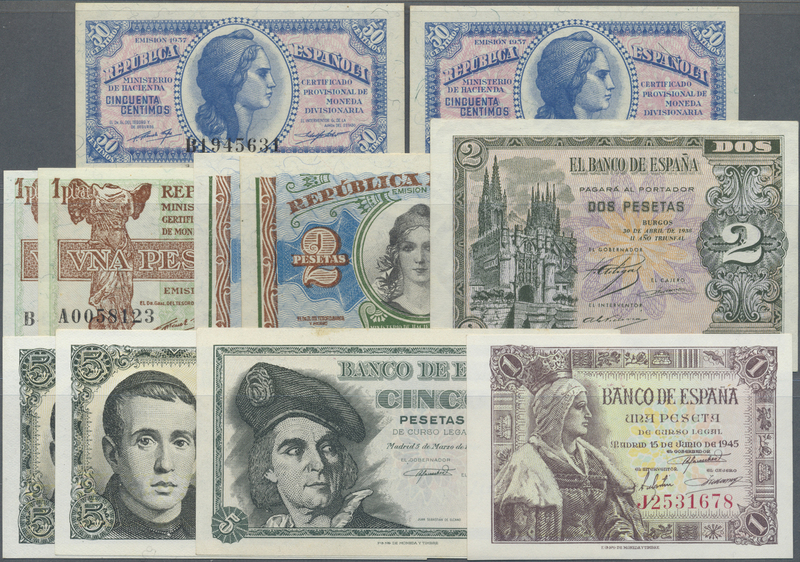 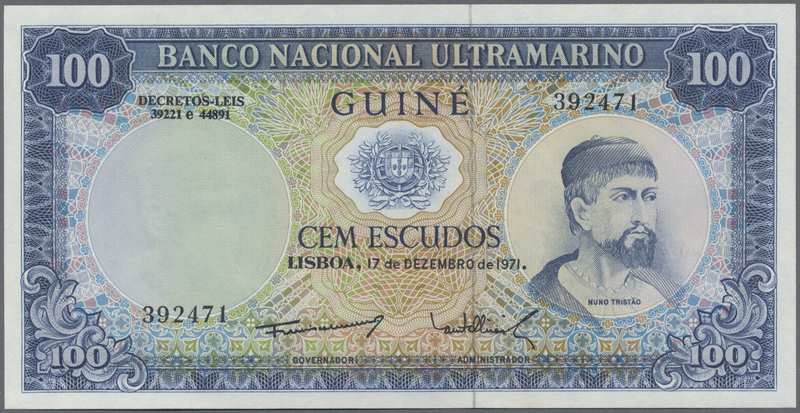 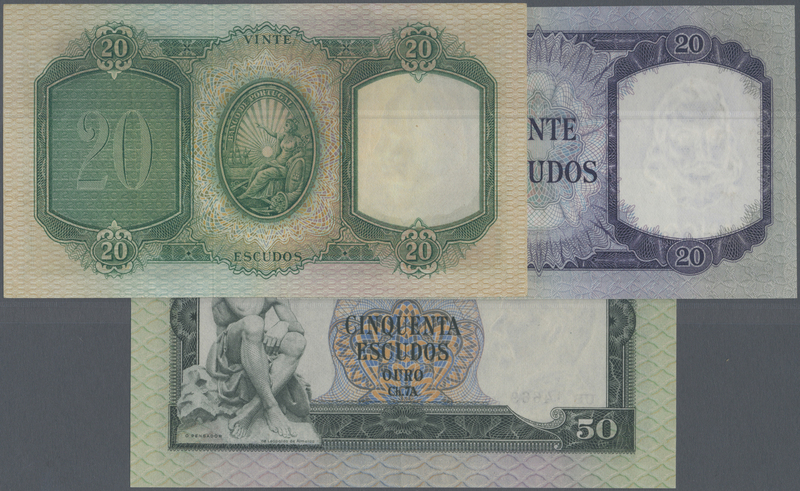 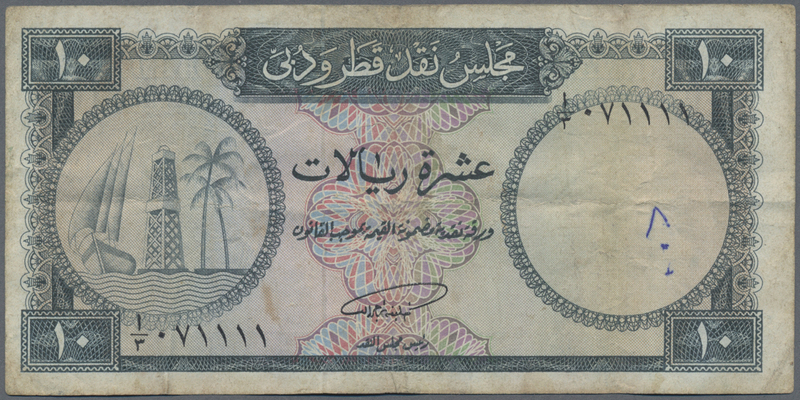 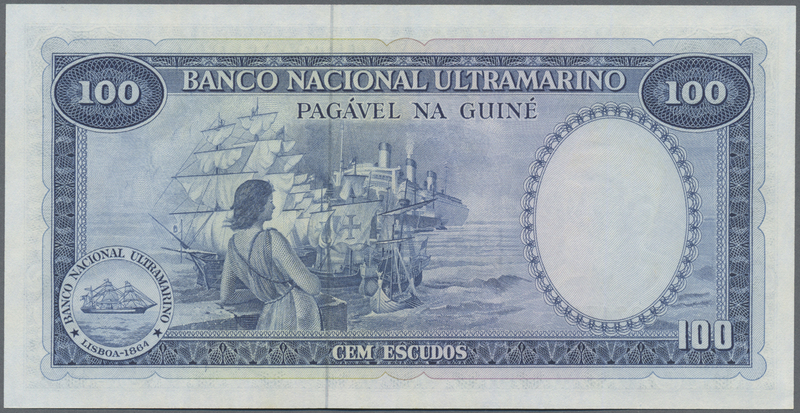 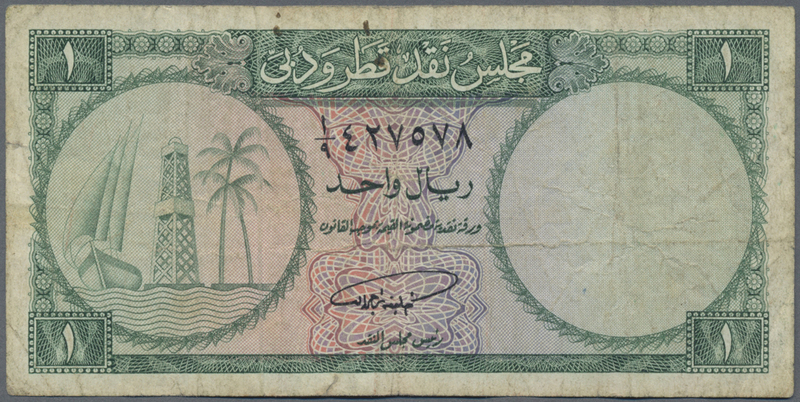 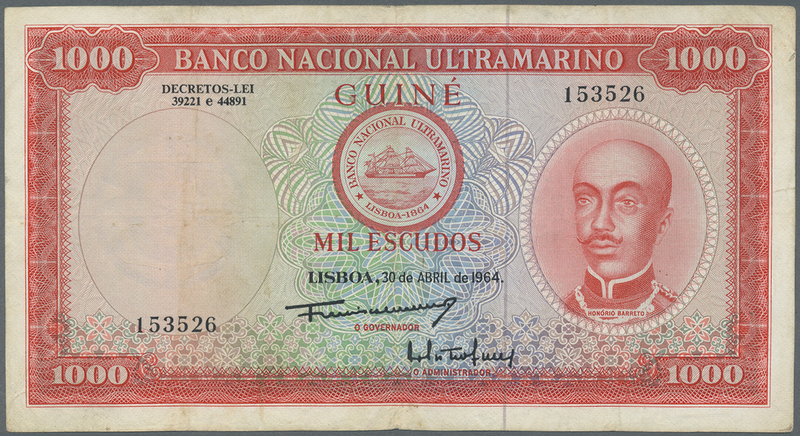 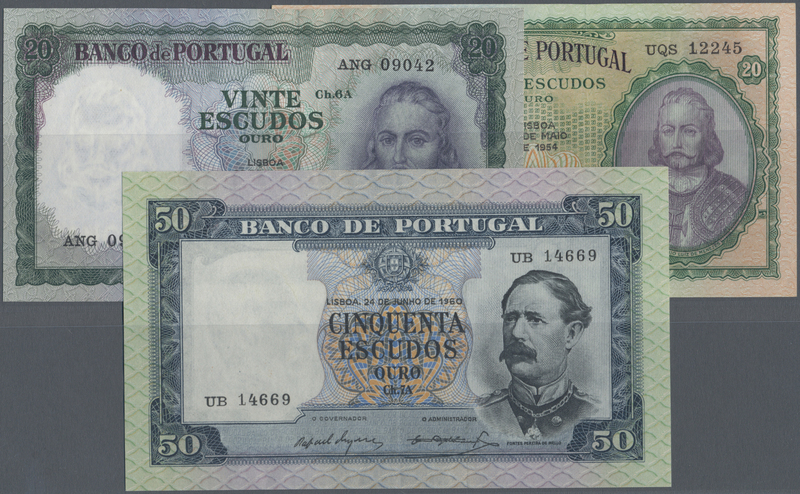 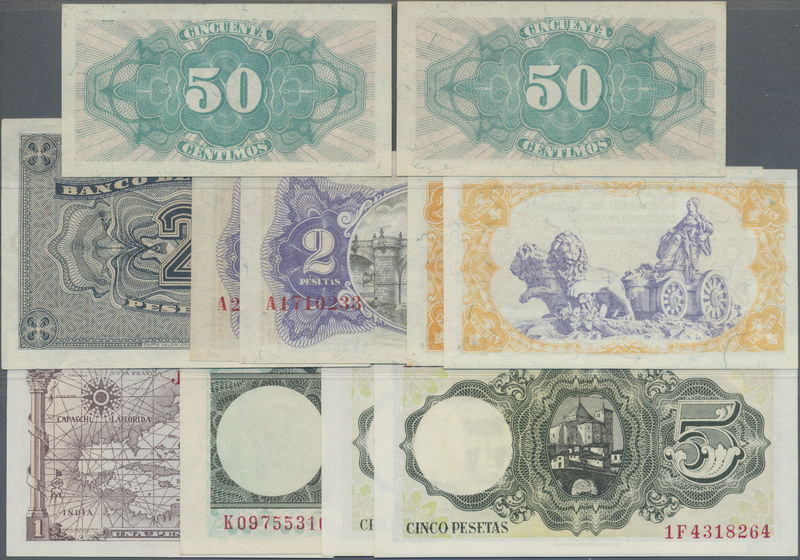 2260 Pick 43 1000 Escudos 1964 P. 43, Banco Nactional Ultramarino, seldom seen in this nice condition, vertical and horizontal folds, pressed, no holes or tears, still strong paper with crispness, nice colors, condition: F+ (optically appears better).